Touring Portugal and Spain for two weeks and this was by far our nicest hotel. The amenities are top notch (linens, nespresso coffee, breakfast, etc.,) but what really made the difference was the staff. Everyone made you feel welcome, and everyone was very helpful. A special shout out to Joao at the front desk. He went above and beyond anytime we needed guidance. Great location. Friendly staff. Quirky property. Would stay again. 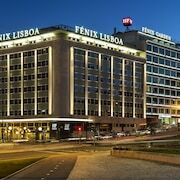 Where to find Lisbon District hotels near an airport? How can I find hotels in different Lisbon District neighborhoods? Where can I find hotels in Lisbon District that are near tourist attractions? 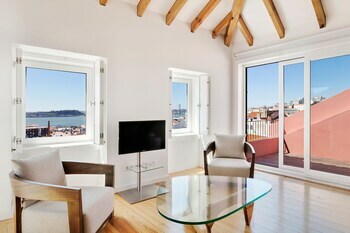 Visitors to Lisboa Region are simply spoiled for choice when it comes to booking great lodgings in Lisbon. Expedia has 395 hotel and apartment options within 0.1 kilometres (0.06 miles) of Lisbon's heart. Visitors seeking a hotel not far from the center of Lisbon, should browse the latest offers at the Bairro Alto Hotel and Lisbon Rentals Chiado. 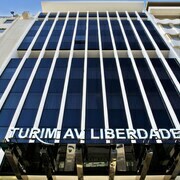 City Center, a popular Lisbon hotel area with 339 accommodation options is 2 kilometres (1 mile) from downtown. Amongst the more popular of the 339 hotel options in this area are the Four Seasons Hotel Ritz Lisbon and Altis Avenida Hotel. Another place you could stay is Cascais. Cascais is where you'll find the The Oitavos and The Albatroz Hotel. Or, try Sintra, where you'll find the Penha Longa Resort and Tivoli Palácio de Seteais. Praia do Guincho is 30 kilometres (18 miles) from Lisbon's downtown, while Oeiras is 12 kilometres (7 miles) from downtown Lisbon. The Fortaleza Do Guincho and Estalagem Muchaxo Hotel can be found in Praia do Guincho, while Vila Gale Collection Palacio dos Arcos and Solplay Apartment Hotel are in Oeiras. But of course, a trip to Lisbon wouldn't feel complete if you don't make a visit to the Castle of Sao Jorge. The Olissippo Lapa Palace and Avenida Palace, are all within a 0.1 kilometres (0.06 miles) radius of Castle of Sao Jorge. 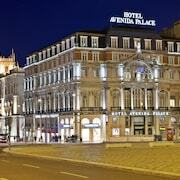 The 9HOTEL MERCY is close to Lisbon Cathedral. 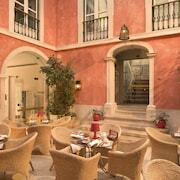 Another nearby accommodation option is the Tivoli Lisboa. If you'd prefer to book a room near Jeronimos Monastery, you could check out the Altis Belém Hotel & Spa or the Pestana Palace Lisboa - Hotel & National Monument. The Cristo Rei, another Lisbon attraction, is walking distance from the Palacio Ramalhete well as the As Janelas Verdes. Hotels that are within walking distance of the Gulbenkian Museum include the Days & Weeks as well as the Fontecruz Lisboa, Autograph Collection. If you have a limited budget and are simply after lower priced Lisbon places to stay, you'll find that there are also enough economy lodgings to choose from in the area. The Hello Lisbon Cais do Sodre Apartments is 0.7 kilometres (0.5 miles) from the center of Lisbon, while the Hotel Arribas is 30 kilometres (20 miles) away. 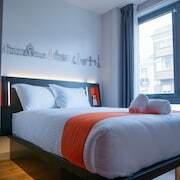 Other affordable accommodation options are the Valmor and the Hotel Florida. 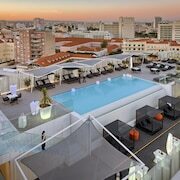 The Myriad by SANA Hotels is 8 kilometres (5 miles) from the main part of Lisbon. Alternatively, the TroiaResidence - Praia is situated 30 kilometres (20 miles) away. 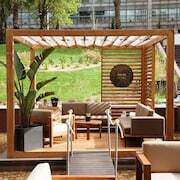 Another option is to book a room at the Blue & Green Tróia Design Hotel or the Hotel Palacio Estoril. After seeing Lisbon, you should leave time to investigate the other attractions in the Lisboa Region area. Lisboa Region is marked by beaches, coastal plains and forests, and commonly visited Lisboa Region tourist attractions include castles and old towns. In this part of Portugal tourists may also try their hand at mountain biking. Avenidas Novas is situated 30 kilometres (19 miles) to the west of Lisbon. While here, you can experience the Adraga Beach. Almocageme Expedia-listed accommodations include the Quinta Da Vigia and Sintra Sol - Apartamentos Turisticos. Alternatively, you could stay at Avenidas Novas, 3 kilometres (2 miles) to the northwest of Lisbon. While in Avenidas Novas, check out the Dolce Vita Shopping Monumental Mall. Places to stay in in Avenidas Novas include the TravelingToLisbon Chiado and Memmo Alfama. If you are traveling into or out of Portela Airport and choose to stay nearby try EPIC SANA Lisboa Hotel or Sheraton Lisboa Hotel & Spa. 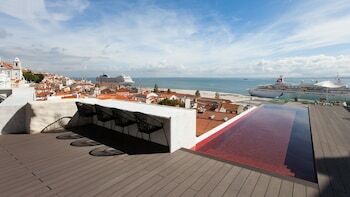 What are the most popular Lisbon District hotels? Are there hotels in other cities near Lisbon District? 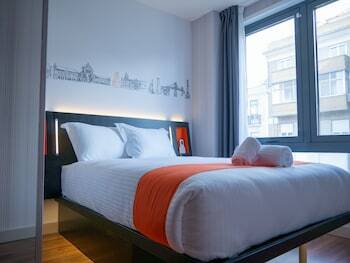 What other types of accommodations are available in Lisbon District? Explore Lisbon District with Expedia.ca’s Travel Guides to find the best flights, cars, holiday packages and more!